Do you want to shine? Of course, you do! Everyone does. A regular suit just doesn't cut it. Where is that sparkle? That pizzaz! That razzle dazzle! Roll into that meeting and get ready to turn heads. Your business model is sure to have those high power executives fighting each other to invest. They've just been waiting to wake up from their PowerPoint haze. Okay, we might be over exaggerating but you're certainly ready to win that party, whatever you're up to. Too many guys roll into a party wearing a boring black suit, however well tailored it might be. Pinstripes just don't give you a chance to stand out. 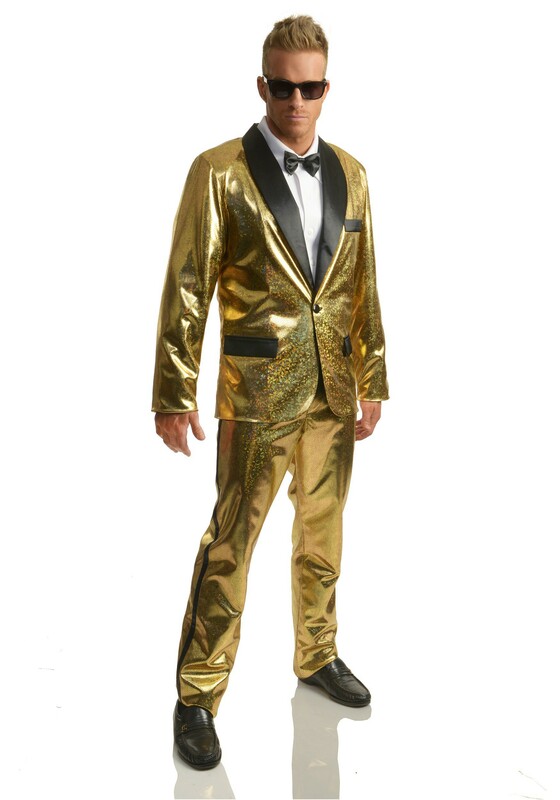 This Gold Disco Ball Tuxedo Costume on the other hand, is exactly the ticket you need. It's the kind of shine that gets you noticed the moment you walk in the door. It's the kind of shine that requires sunglasses just for people to catch a glimpse of you. It's the kind of shine that they never forget!